There are those who were involved with Noh from a very young age. There are those who were attracted to Noh as adults. There are all sorts of relations with Noh. with and relation to Noh, its attraction for them and its charms. When I was a child we had a pond in the garden. I liked to play idly by the water. Swimming in the water were the likes of backswimmers, tadpoles, carp and goldfish. On the bottom of the pond would be the carcasses of bugs that belonged on the land. 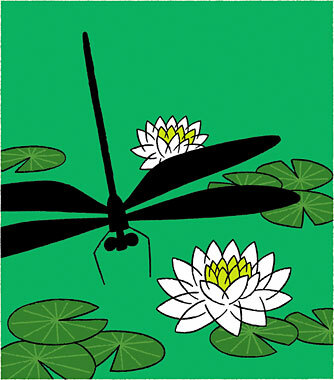 I'd spend all day watching a dragonfly nymph develop its wings and turn into a full-fledged dragonfly. For me, it was a precious time. I became a manga artist as a junior in high school. Looking at the floor of the pond, or watching the flame of the room heater in the winter, I was somehow oddly able to concentrate and a story would come to life. I made my acquaintance with Noh at the same time I became a manga artist and I was surprised to learn that Noh had no logical development or structure in the European style. 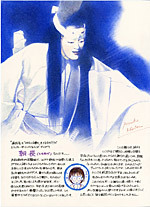 In much of Noh, something has already happened in the past and the main actor, often as a ghost, will speak while reminiscing or remembering that something. And then, whether he dies or not, he smartly disappears when the talking is over. Some 20 years later, in 2001, I began a manga series with a Noh performer as the main character. Until that time, I would go to watch Noh about once a year. From then, however, in order to study, I saw some 100 Noh plays in the span of one year. I watched a video with the late Tetsunojo Kanze the 8th in “Tomonaga,” and saw the utterly unbelievable way the expressions of a Noh mask could change as if it were a living person. Wow! I was so impressed. That a human was capable of something like that was utterly amazing. It was one of the reasons I definitely wanted to see Noh performed live. Perhaps it was also because I liked Noh to begin with, but I was hooked in an instant. In the beginning I would follow the plot carefully and closely. But after watching a play two or three times in a row in the same season, the time also became a time when I would be drawn into my own thoughts with the entrance of each performer. I think there are probably lots of people for whom the play “Sumidagawa River” invokes memories of saying farewell to a loved one. It's the same with the performance by Hideo Kanze in “Obasute.” After the person from the city leaves to continue on his trip, the main performer playing an old woman is left alone on the stage. Instead of feeling someone has left the stage, I feel the emotions of the shite, the main actor, and how the person leaving disappears from his heart and how he is then overwhelmed with feelings of affection from the past. As I watch the stage, I am taken back into my own past. And it's not just these clear thoughts I experience. The darkness of night. Vague faces of people from the old neighborhood. The work I have today. The water hyacinths and the way they used to bloom on the river. All sorts of memories come up and are dealt with, they remain or they disappear...and in time then I am returned to the stage as if nothing had happened and I carry on with my everyday life. For me, watching Noh is like dreaming. When the house was renovated we lost the pond. And there's no more heater where you can see the flame. Now, it's become automatic fan heaters and heated flooring. Perhaps Noh to me is like that waterside or like a flame. Like that place that balances to “life and death” or “consciousness and unconsciousness.” As long as I am alive I will dream. Perhaps I dream in order to live. Recently, I became hooked on the town of Uji upon traveling there for a work project. There's an inn I always go to with a room that looks out directly onto the Uji River spreading before me. I never tire of gazing out on it. In the early summer the bugs are swarming and birds and bats are drawn to them. Sometimes they'll dive into the water. Fish and bugs are hatching. It's a dynamic cycle of life, this waterside I love. I'd like to invite him to Noh some time. I'm sure he will be hooked. Born in Aomori in 1960. Debuted in 1977 with “Hitoboshi e dozo” (Invitation to a Star) in the girls' manga magazine “Hana to Yume” (Flowers and Dreams.) Her best known works are “Eirian Dori” (Alien Street) and “Cipher.” Acclaimed for her precise and intricate drawings and “watermark,” a collection of her pictures. Currently, her “Hana Yori mo Hana no Gotoku,” a manga series featuring a young Noh performer, runs in the bimonthly magazine “Merodi” (Melody) The latest collection, No. 6, of the manga series will be published Nov. 5.